After 3 days of relaxing with family and friends in Sunriver, riding Mt. Bachelor and exploring Bend, Todd, Andrew and I headed out to Tam McArthur Rim to test out the new yurts run by Three Sisters Backcountry Inc., which are in the first year of operation. 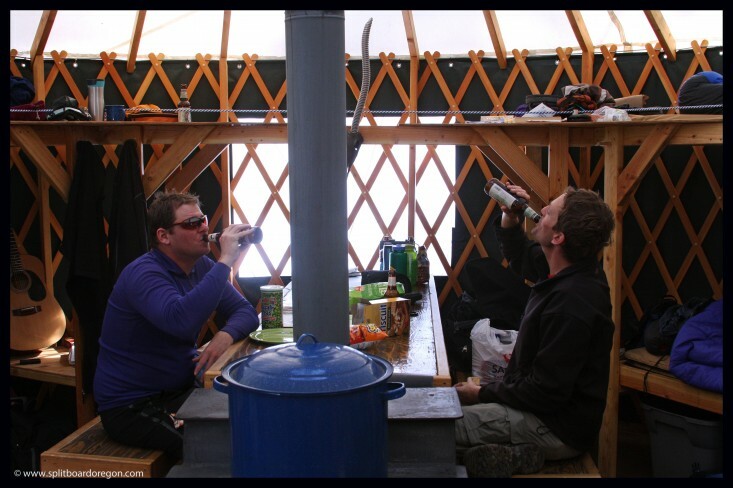 These guys offer fully guided trips, but we chose just to be shuttled into the yurt, dropped off and do it ourselves. The place lived up to expectations. We left Sunriver early in the morning, and after a brief stop in Sisters, met Shane at the trailhead. 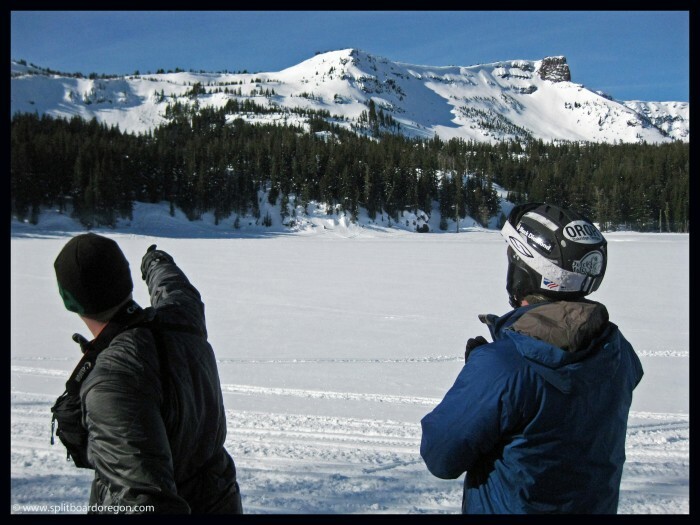 We quicly loaded our gear in the sled and trailer, and headed out for the 6 mile snowmobile ride into Three Creeks Lake. 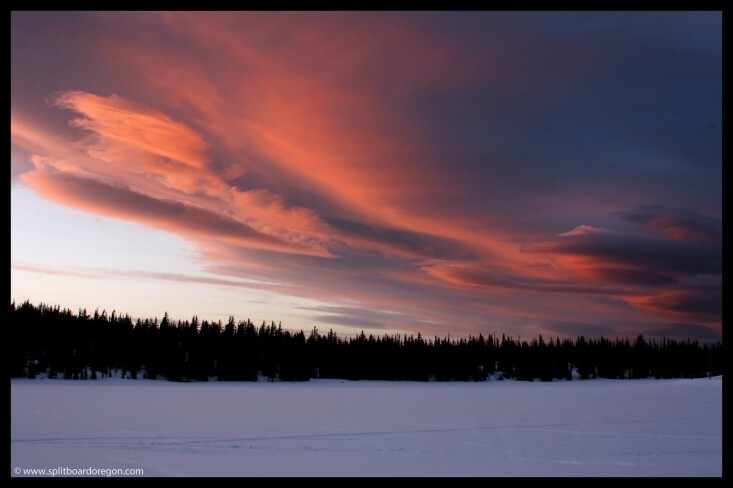 The lake sits at the line of the Three Sisters Wilderness, so access up the relatively flat 6 miles of road is by snomo or skins, but the Rim area is all accessed by skins. 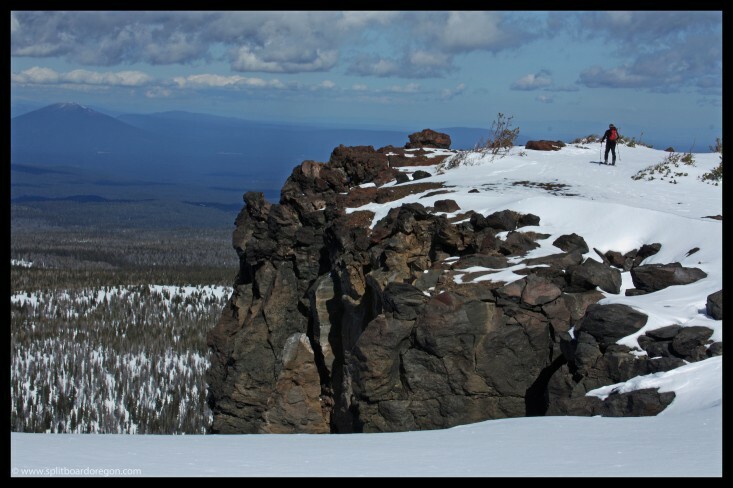 It wasn’t long before we started gaining some elevation, and the terrain of the rim opened up before us. 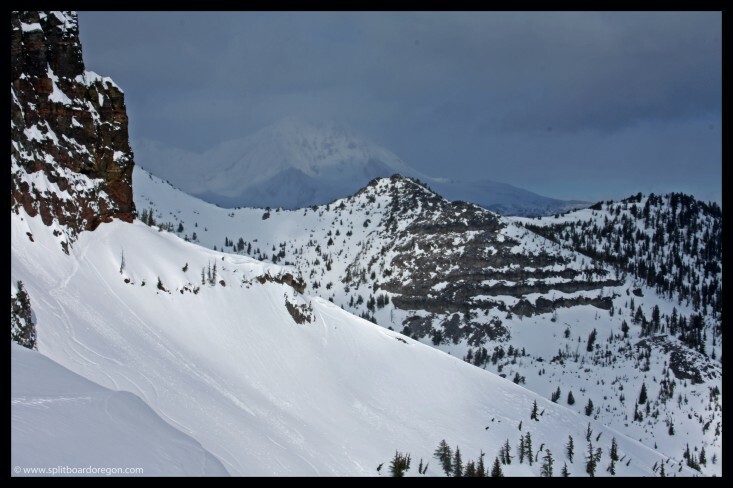 This shot shows Todd skinning out to the overlook, with Black Butte in the background to the left…. The lines out towards Broken Hand (center left) and Broken Top looked tasty……a couple of the steep couloirs on Broken Top had a few tracks that were probably 4 or 5 days old, and were most likely Shane’s from Three Sisters Backcountry, as he said he’d hit the north face a few days earlier…..
We dropped in on the east facing line off the high point of the ridge after digging a pit that revealed no instabilities. 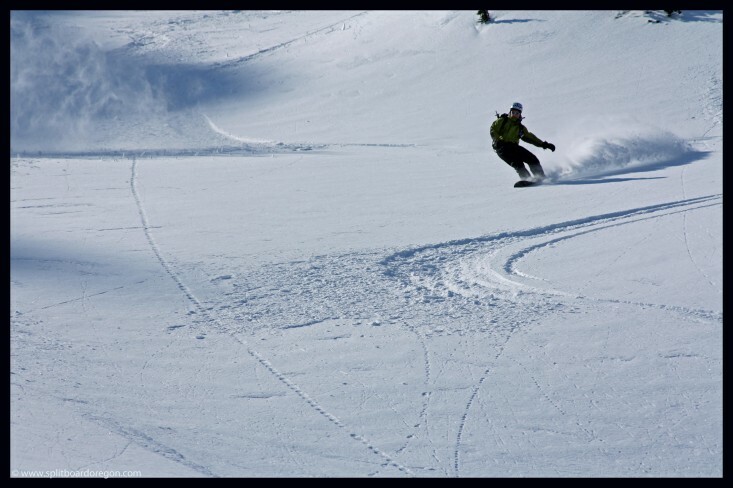 The turns were decent wind packed powder, but we were in search of something a little better. 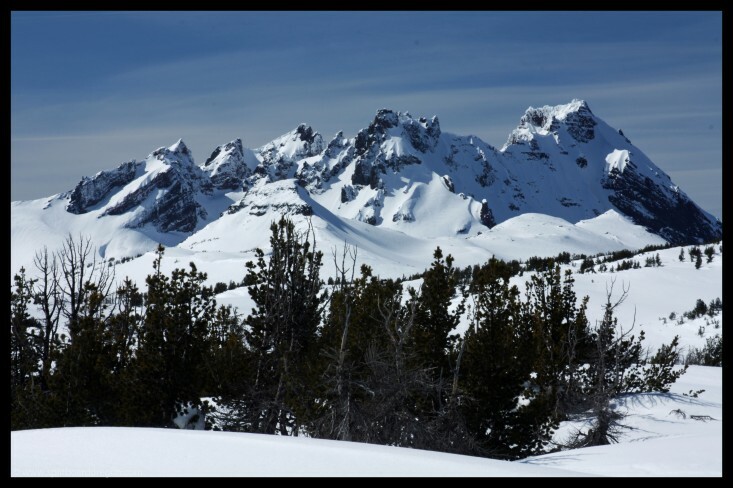 We skinned back up to the top of the ridge to an area called the Playground, and proceeded to make a couple more laps before heading down to the yurt to get settled in for the evening. That night we had a good freeze dried dinner, but will definitely be packing a bit different next year as the kitchen is fully stocked with cooking gear. The yurt was super cozy, and we kept the fire going most of the night. The next morning dawned clear and cold, so we toured out towards the main bowl in the rim. We rode down the east part of the bowl and then switched to skins to put in a track and hit the goods on the west/middle section. 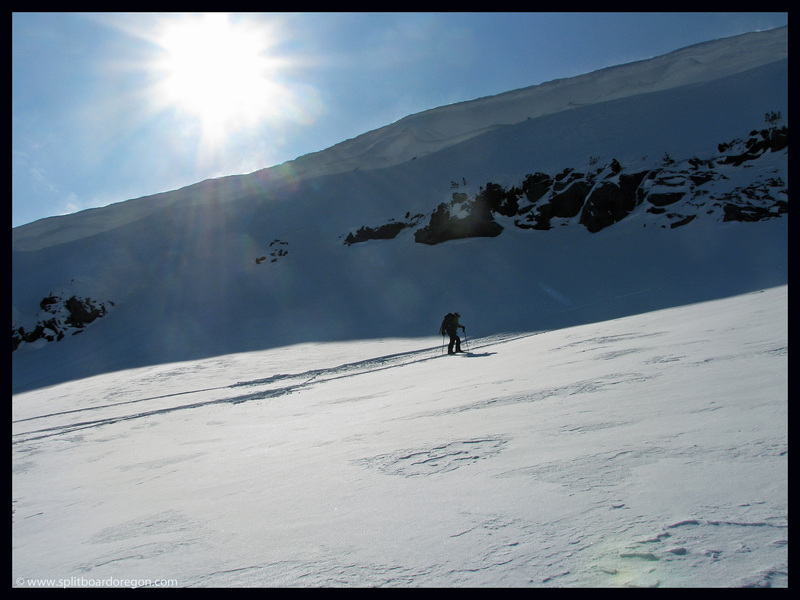 Here’s Andrew riding down just before the traverse began…. The powder was epic, due to the fact that all the moisture had been sucked out of the snow from temps in the single digits the night before. Again, we dug a pit near the top after skinning through some small trees. It revealed a weak layer 80 cm down or so (an old crust), but there were no results with an extended column test or compression test. The first run down the bowl was amazing. 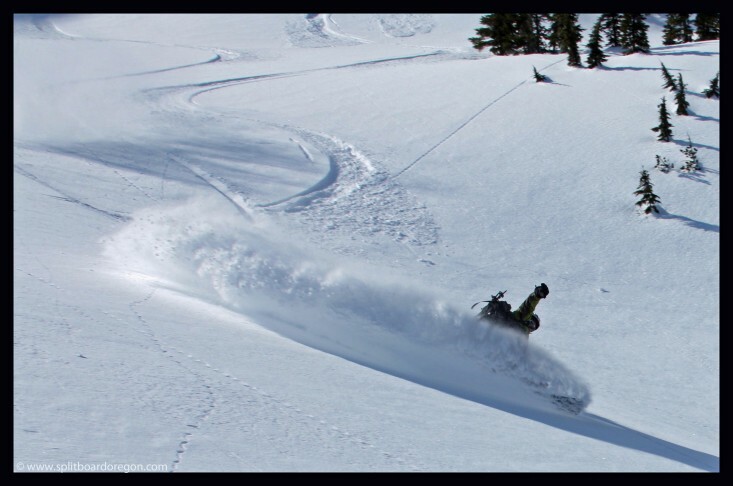 Here’s Todd ripping some fresh stuff in one of the main bowls……..
Andrew then dropped in and took a few photos of us riding with my camera. 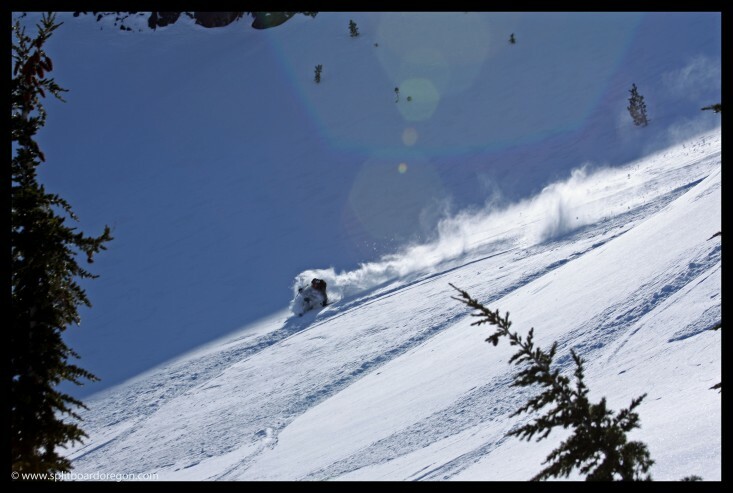 Here’s a shot of me riding the goods…..
We skinned back up for more laps, since the vertical we were getting was around 1000 feet per run. 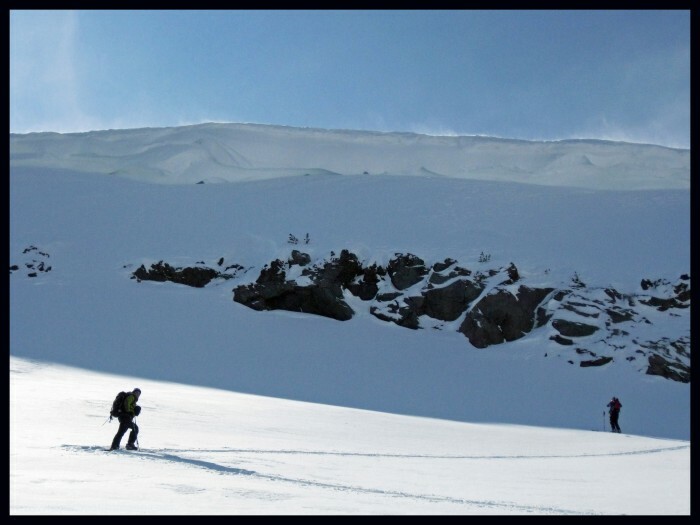 A slight upwind had partially filled in our skin track near the top of the bowl…. 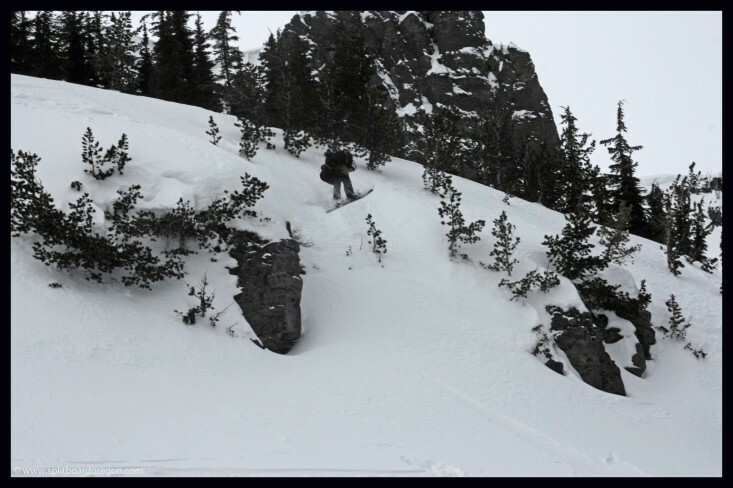 Dropping in for the second run, the snow was just as good as the first……. 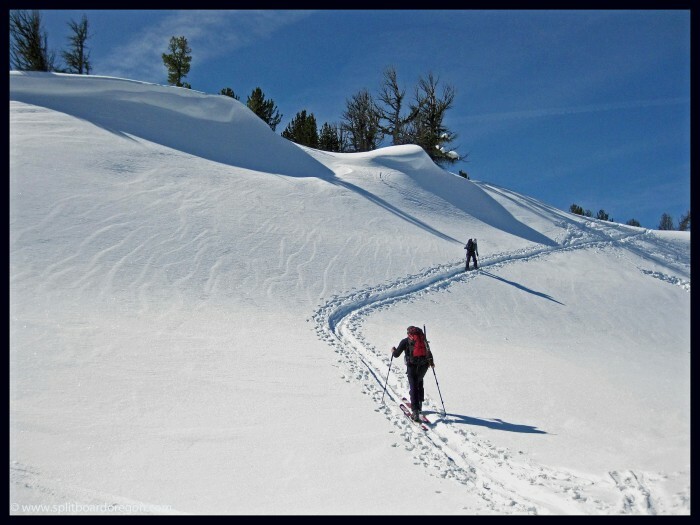 The snow was so good we continued back up our well laid skin track for more. 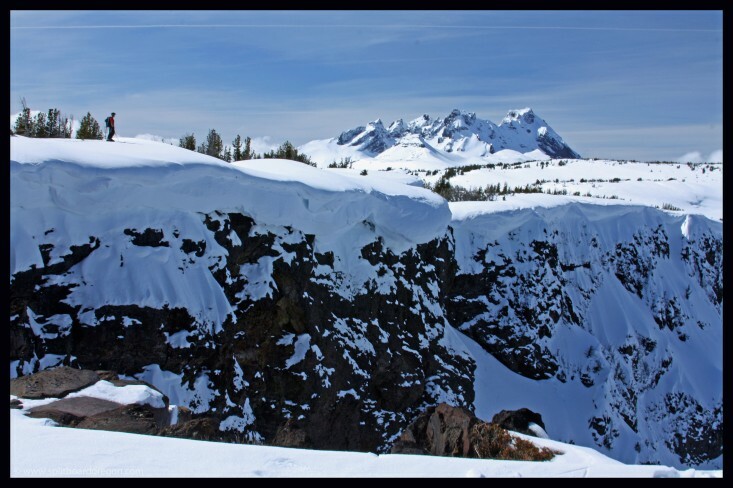 The shot below shows the massive cornices above us that protect the rim. You wouldn’t want to be under one of those when they break off in the Spring. The wind was whipping a bit and you can see the snow blowing off the top of the cornice. We shot a bit of video of the wind and blowing snow, and it turned out pretty well. 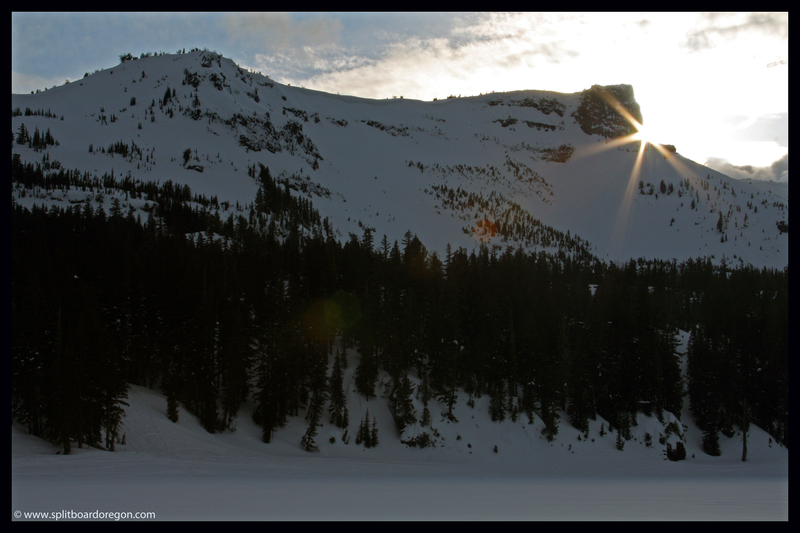 Waiting a bit longer in the cold while drinking my beer paid off, and I was able to snap the below shot of the evening glow over Three Creeks Lake…. That night, we made sure to stoke the fire well, and also paid a visit to the sauna. I brought out the tripod and Andrew and I messed around taking night time photos. 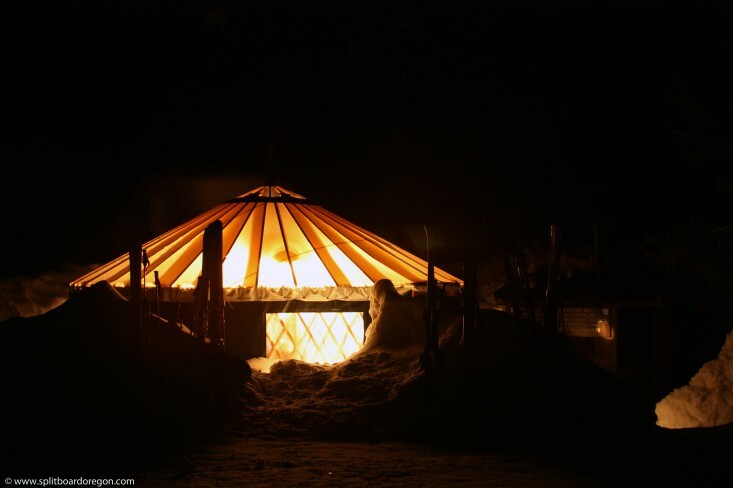 This shot of the Raven yurt with a 30 second exposure turned out really nice…. We toured back to the yurt around 10:30 and started to pack stuff up in preparation for a 2:00 departure. After some lunch, the three of us enjoyed a few games of Scrabble and got quite a kick out of some of the “words” we made. 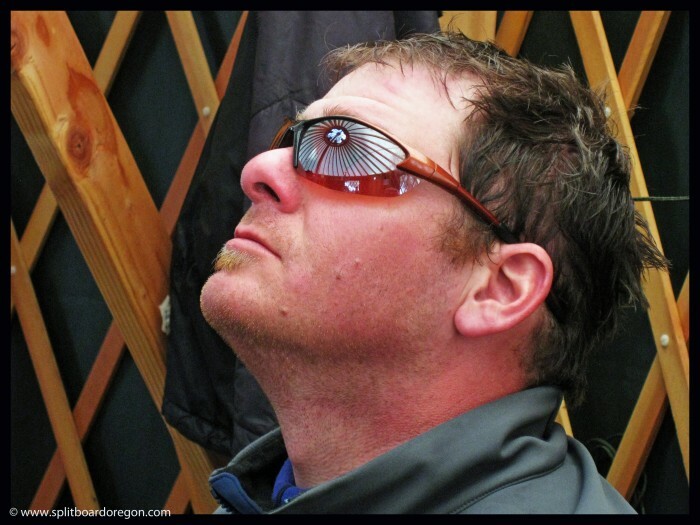 Andrew snapped this shot of Todd with the top of the yurt reflecting in his sunglasses…. Since the trip was almost over, we decided it was a good time to crack a few beers (when is not a good time to crack some beers?) and enjoy the warmth of the fire………. Todd and I went back out for one more run and Andrew stayed in the yurt. We toured to the top of the rim, and headed east instead of west. 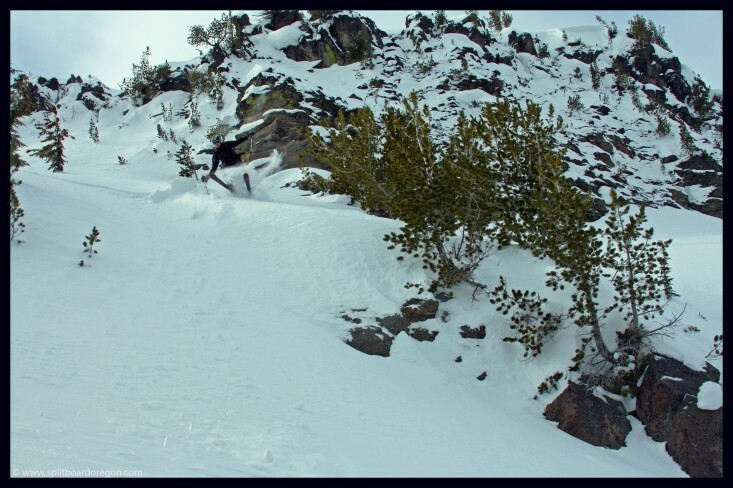 We dropped into the Playground area, made nice big sweeping powder turns, then entered the trees lower down and rode our way out to the yurt. 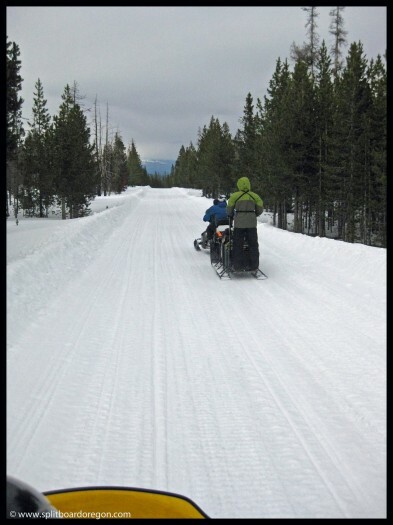 Shane was back at the yurt with the sleds, so we packed our gear and loaded up for the 6 mile pull out to the trucks. Here’s a parting shot heading down the access road…. This was a great trip, with ample area to play and ride. Our reservations are already in the books for next year!! !